My latest box from Young Living arrived this week – with a little bit of Joy! Yes, Joy was in my box. Well, a bottle with a blend of essential oils called Joy was in my box. Neither Young Living or the FedEx man can bring true joy to my doorstep. That kind of joy only comes from God. If you deal with depression, Joy is a must have oil for your arsenal. I'm already loving it after using it for just a few days. I've been using it over my heart/on my chest as well as on my neck like a perfume. After applying, I breathe in the scent of the remaining oil on my hands. It's so refreshing! Joy can be used in a diffuser too. the devastations of many generations. Depression is such a dark place and that's not where God wants me to live. He wants me to live in joy instead of mourning and he wants to see me live in praise instead of weariness as Isaiah 61 tells us. 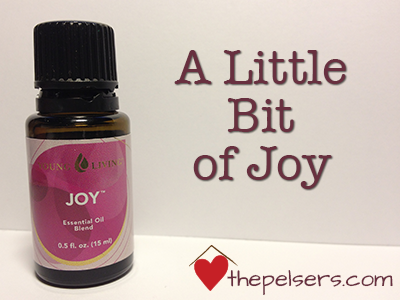 I love how Joy oil helps lift my mood and helps me focus. I wish I hadn't waited so long to get a bottle of Joy oil. It will definitely be a part of my hospital bag when I go to have Baby #3 in a few weeks. Joy will be a big help with with all those post-delivery hormone crashes! Want to try Joy? You can get it through my Young Living Oil site. Disclaimer: I'm not a doctor and I don't claim to be one. This is not medical advice. I only recommend Young Living Essential Oils because they are therapeutic grade essential oils. Amanda is a former church communications director turned work-at-home(schooling)-mom. She has a MA in Old Testament Studies and a BA in Bible. She's married to her high school sweetheart and they have four boys. She writes about faith, motherhood, and homeschooling at The Pelsers. I love Joy too — funny though I did not LIKE this at all initially — proof that I needed it. While I now truly enjoy the smell — I keep wearing it. 🙂 I smell myself. Hah!! Thanks for linking up! So excited you did, friend! When I initially opened the bottle, I didn’t care for the smell. As soon I put it on, I loved it.